Excerpt from Into Africa. Article written by Africa GreenCo CEO Ana Hajduka. The potential for renewable energy in sub-Saharan Africa is staggering but as noted by Akinwumi Adesina, President of the African Development Bank, during his launch of the New Deal on Energy for Africa, “Africa cannot power its economy with potential”. 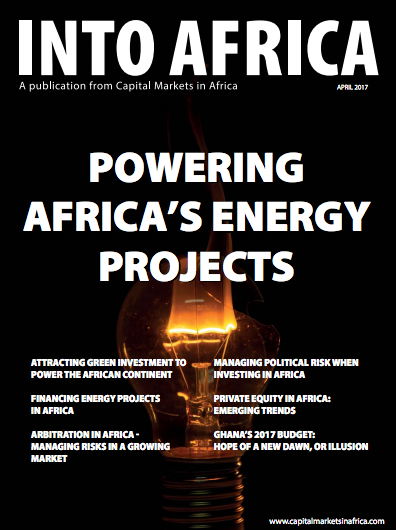 A principal challenge for host Governments, the African and international development community and others seeking to support the deployment of grid-connected renewable energy in sub-Saharan Africa, is how best to convert this staggering potential into operational projects, which in turn can provide dependable, affordable electricity on the scale required for economic and social development of the region. At USD 0.12/kWh, the average power tariff is almost double that of other developing regions, and this only partially covers the average generation cost of USD 0.18/kWh. In practice, the average cost of electricity for consumers is increased yet further by reliance on costly backup diesel/heavy fuel oil generators, representing up to half of total installed capacity in some countries. Furthermore, as one of the regions of the world most acutely affected by climate change, Africa also faces a particular imperative to minimize its potential impact by moving away from fossil fuels as the main focus of the region’s new investments in generation capacity.